Your investment includes downloadable handouts and one-year access to all written and video content as well as the private Facebook community. Upgrade to the Complete Experience (all three classrooms) for $295, get LIFETIME access to all content, and save $70! Ready to take your marbling to another level? The Advanced Marbling Techniques classroom builds upon the basic principles of marbling so if you have some marbling experience, then you will have a lot of fun as we dive into advanced patterns, play with new materials, and every once-in-a-while go rogue in the tank! So put on your Adventure Hat and approach these lessons with a sense of curiosity . . . and bring your sense of humor too because whenever we break the rules, unexpected (and usually delightful) things result. Let’s go have some more fun at the marbling tank! Clouds on Water is a self-paced eCourse you begin at any time. All materials, videos, and downloads are available to you upon registration and depending on which package you choose, you will have from one-year to lifetime access to all content. In addition, there is a private Facebook group where participants can interact with one another in a supportive community. There are times I also bop in and give feedback, answer questions, and provide troubleshooting advice as needed. Building on the Introduction to Paper Marbling eCourse (or on your own prior marbling experience), you’ll continue your exploration of marbling with advanced technique instruction and experimental play. Advanced techniques such as masking. 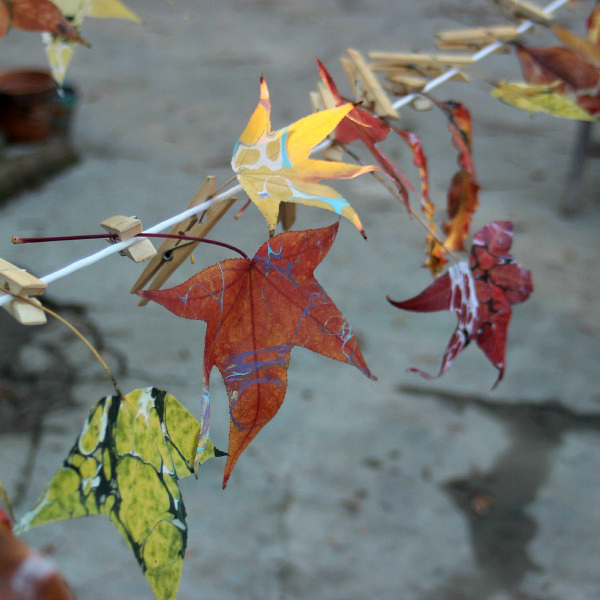 Marbling on non-traditional materials such as wood, vinyl, clay, and leaves. Using additives and non-traditional substances to create special effects. Do I need to know how to marble to take this eCourse? Yes, prior marbling experience, or the Introduction to Paper Marbling eCourse is required for this class. This eCourse does not teach the basics of marbling such as how to make a bath, mix paints, or apply the mordant. You should also have an understanding of basic pattern technique such as Stone, Gelgit, and Nonpareil. You don’t have to be a master marbler . . . you just need to know the basics! What kind of space is necessary for the Advanced Marbling Techniques eCourse? All the lessons in the Advanced Marbling Techniques eCourse can be done in your existing marbling space. No additional space is required. Keep in mind, marbling, as always, is a WET process and you will likely get water on the floor and paint on the table. Covering your table with plastic or protecting your floor with a drop cloth are easy solutions. Marbling in a garage or on a patio is another option. How much time do I need to marble? The techniques and patterns taught in this course are easily incorporated into your regular marbling practice. No extra time beyond what you normally invest in a marbling session is necessary. The materials needed (beyond the basic marbling set up) will depend on your personal goals and inspiration! This list includes some of the materials demonstrated in the course, however, many things you can source from your own experience and resources . . . and imagination! A more detailed list will be sent to you once you register. Visit the FAQ page for additional commonly asked Q&As. Or if you have a question not answered here, feel free to contact me! Are you ready to go rogue in the tank and have some marbling fun? I would absolutely love to take you on the journey so you can discover the adventuresome marbler in you. I fell in love with marbling more than a decade ago and since then, I’ve made it my passion “to bring marbling to the masses.” I wanted to make marbling accessible to everyone, not just those who happened to have a marbling teacher in their community. So I set out to create a high-quality learning experience with the depth and breadth of knowledge that only comes with thousands of hours of marbling under one’s belt . . . and boundless passion for the art form. Clouds on Water was made for you. More marbling classes with Barb!